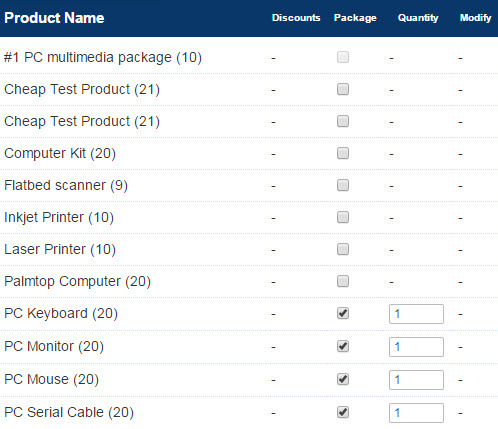 From Version 6.5 you can bundle products together and create custom packages to offer your customers. The software will take care of the package prices, weight and stock so all you need to do is choose the products you want to have in the package and start offering them on your store. The products in the bundles will still be available for purchase separately but this feature allows the store owner to combine items to make a custom set of products. Discounts can be set on the bundle which wouldn't have to be set on the individual products. We have an example available on our store with the CSS Package - add to cart for a 20% discount on our three most popular css based utilities. Go to your product admin page and set up a new product which will be the bundled item. You won't need to add true details to the price or weight field as that will be determined by the products added to the bundle.